Protests in the streets seemed inevitable, even before the details of the Trans-Pacific Partnership (TPP) were made publicly known. In the week following the signing of trade deal in New Zealand on February 4th, protests erupted from Asia to the Americas. Some of the most virulent protests took place in South and Central America: Peru, Mexico, and Chile, the Latin American signatories, all saw their citizens take to the streets. 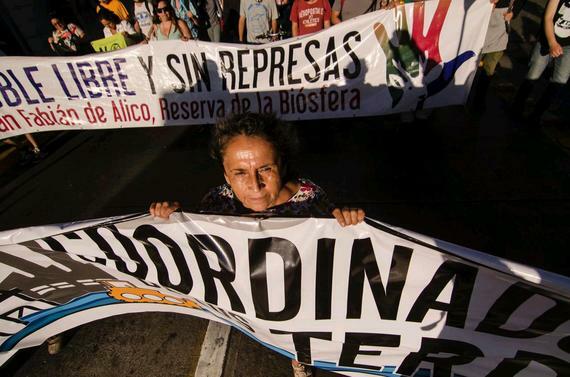 As reported by the Peruvian newspaper El Comercio, fliers claimed the TPP "... is the most dangerous trade agreement signed in history because it threatens national sovereignty, access to medicine and the Internet, healthy eating and a clean environment." While such a claim is preposterous, it is nevertheless true that the TPP, which will affect 40 percent of the global economy, has been cloaked in secrecy and controversy for much of the seven years it has taken to develop it. Its intended purpose, leaders say, is to ease trade around the Pacific Rim, create jobs, and eliminate poverty in participating countries. So why are people in countries like Peru, whose economy could potentially benefit greatly from such an agreement, protesting? The case against the TPP revolves around its secretive nature and concerns about its impact on worker protection laws, the environment and human rights. For other activists, the TPP is the pinnacle of corporate power, a trade deal that is meant to benefit the bottom line of big companies at the expense of governments and workers. Finally, critics question the significance of increasing food dependencies, the failure to include advocates for workers' rights in the discussions leading up to the treaty, and the opaque mandate awarded the nefarious ISDS courts. However, that is a profoundly warped understanding of what the TPP seeks to achieve. In truth, a more balanced take on the treaty would paint quite a different image. Some countries are optimistic about the opportunities a trade deal of this sort can open up, particularly Vietnam and Malaysia, which benefit geographically from being integral parts of the Asian value chain. For example, twenty-six percent of Vietnam's exports comes from the production of apparel, footwear, and textiles. These industries already lure clothing manufacturers with cheap labor and light regulation. Even with heavy tariffs of 20 to 48 percent on goods shipped to the U.S., moving manufacturing to Vietnam has been profitable. TPP will eliminate tariffs or cut them so low as to be virtually non-existent, increasing the profitability of companies choosing to manufacture in Vietnam. The decrease in trade restrictions is likely to provide even more incentives for American and even Chinese footwear companies to move their operations to Vietnam - a well-trod path for American companies, but a complete novelty for China. It's not surprising that Beijing will lose up to $100 billion every year following the signing of the TPP. Malaysia, too, is in a position to benefit greatly from the TPP. Closer economic ties to the U.S., Canada, and other large trading partners offer enhanced access to markets for their electrical and electronics products, textiles, and automotive manufacturers. Concerns about worker rights (so prevalent in Latin America) were successfully dispelled under the administration of Prime Minister Najib Razak, who passed a series of demand-side measures meant to improve the living standards of Malaysians. A minimum wage, as well as the creation of hundreds of thousands of jobs has sent the country's poverty rate to 0.6 percent. When tariffs are removed, Malaysia is projected to achieve gains of anywhere from $107 to $211 billion between 2018 and 2027. Inexplicably, though, Latin American governments have had a harder time explaining to their citizens why the TPP should be embraced--even as Southeast Asia's gains have been widely publicized. A large Latin American bloc supports the TPP, and Colombia, Costa Rica, Panama and others are already positioned to join it at some later point. These Latin American free-trade-friendly countries are poised to take advantage of new opportunities the agreement will make available, such as opening new markets for export - most importantly, the Pacific corridor. Moreover, parts of Latin America that have embraced globalization will be able to develop their own value chain in their respective geographic areas, contributing to economic growth throughout the region. Mexico, which is Latin America's second-largest economy, has become a manufacturing powerhouse and major exporter. Thanks in large part to its embrace of free trade, Mexico is now among the largest producers of flat screen TVs and automobiles in the world. Through the signing of the TPP, these industries will be able to export to wealthy markets in New Zealand and Japan and boost the economy by approximately $150 billion in five years. In addition, data exchanges are covered in what amounts to a digitalization of NAFTA. Peru and Chile have depended on exports, primarily to China, of such commodities as ores, minerals, timber, and food products. With the decline in China's economy, they have the opportunity to find other, similar markets. In this vein, Peru's exports will expand by 10.3% while Chile's will grow by 5%. What's more, not to participate is potentially more costly than actual participation. Chile, Peru and Mexico will not just reap billions in extra trade, but they will also get a seat at the global trade table and benefit from the capacity to actually shift the rules of future agreements. Not the same thing can be said about the free trade skeptics of Mercosur countries, who, by choosing to stay outside the TPP and other likeminded initiatives, will be further marginalized and disengaged from the burgeoning Latin American value chain. As markets open up, the enduring economic power will be in the hands of countries that are able to do business on a global basis.